The Treasure Map of Boys: Noel, Jackson, Finn, Hutch--and me, Ruby Oliver by e. lockhart. Delacorte Press, an imprint of Random House. July 2009. Reviewed from ARC. Copy supplied by publisher. Companion to The Boyfriend List and The Boy Book. The Plot: It's the second half of Ruby Oliver's junior year. Things seem better. She now has two friends (two! ), Nora and Meghan. And Noel likes her, but because Nora likes Noel, Ruby has promised herself to stay away from Noel (even tho Ruby likes him, also.) And Jackson is back in the picture! And maybe Finn. And Hutch is still there, working for her father. Kim and Cricket still don't talk to her. Things should be better. But Ruby is lonely; it's been over thirty weeks of no boyfriend! And she's still getting panic attacks. And the rumors may be starting again. The Good: I reread my reviews of the previous two books (linked above) and saw I'd written this: I'm not sure if another book is planned; but while Ruby has grown more by the end of this book, she does has further to go and I look forward to visiting with her again and seeing how it all works out for her. Ruby did have further to go and in this book she finally, finally, gets more in touch with herself, her friends, her world. On the surface, this book is about boys. The boys Ruby likes, the boys she likes, Ruby figuring out when flirting is just fun and when flirting is something more. And you know what? That can be enough. Many teenagers share those same concerns and worries. Why not have a smart, funny book about navigating love and lust and friendship? 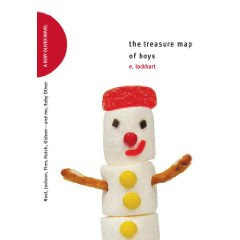 It's a bonus that the treasure map of boys is about more than romance; it's about figuring out what one really wants and also owning one's own actions. And it's also about heavy metal music and cupcakes. Ruby is a junior in high school. And as she talked about boys and boys she likes and boys she (maybe) flirts with, I had two thoughts. First, Ruby needs to get to college where it's not the same small group of people. Second, it's almost incestuous, this small school, and part of Ruby's problems arise from being in such a small, close environment. Ruby cannot date Finn who she's know since grade school because he used to date Kim; flirting with Noel is a no-no because Nora said she likes him. The threads of connectiveness go on and on, muddled and confusing. No wonder Ruby is having panic attacks! Whatever you do, Ruby -- do not go to a small college! Go to a big one where you don't have to worry about this type of stuff! Ruby remains as wonderfully funny, delightful, and wry as ever in her observations and for that reason alone, I would read another book about her. But, honestly? Ruby's journey, as it has been played out in these three books, feels done. Finished. Resolved. I love that it took Ruby this long to really, truly find the answers within herself. While this works well as a standalone (Lockhart does a terrific job of quickly recapping past episodes, events and characters), the Ruby Oliver books are best read as trilogy. I love these books, and I love that the publisher is keeping the look -- quirky with red accents. Nice. And Ruby! Long may she reign! She's so fun, because she's conflicted and she's okay with being earnest and TRYING to do right, even if it's... sometimes... muddy exactly what "right" might be. I'm pretty sure there's going to be a fourth book, tentatively titled A REAL, LIVE BOYFRIEND. Which I think will be interesting - to see Roo in an actual relationship, instead of just flirty ones. There's more growth for us to witness - and I, for one, can't wait. Hmmm.... a fourth Ruby book? You know, you're right; the shift between Ruby having panic attacks & second guessing herself, from "oh was I flirting" to a (hopefully) healthy relationship will be interesting to read about!